Update: Israeli lawmaker Miki Zohar from the governing Likud Party appealed to an Israeli parliamentary committee in a request to hold an urgent discussion concerning China’s refusal to approve allocations of Chinese workers for construction sites in Jerusalem, Yedioth Ahronoth reported on Wednesday. “At a time when many countries are moving their embassies to Jerusalem we cannot accept that workers who arrived through at the encouragement of the state will not be allowed to work in the city,” Mr. Zohar said in the report. China has started blacklisting specific Israeli construction sites following a series of deadly work accidents, an Israeli state official said in an interview with Calcalist speaking on condition of anonymity. On May 7, 38-year-old Chinese citizen Chen Zhong died after falling from a 20 feet high scaffolding in a Jerusalem construction site. In 2017, China agreed to allocate 20,000 trained construction workers to Israel. The agreement pertained to 6,000 workers as a first stage, out of which only around 2,500 are currently working in Israel, according to the Israeli state official. A few hundred construction workers coming from China arrive in Israel each month, the official said. According to the current agreement with Israeli authorities, Chinese citizens can start working on Israeli sites only after individual assignments have been approved by China’s Tel Aviv embassy. So far, all requests pertaining to sites in the West Bank and Jerusalem, have been denied, but in recent weeks requests pertaining to real estate companies with a high rate of accidents are also being denied, the Israeli official said. The agreement was signed due to the Israeli construction industry’s shortage of trained personnel. The rate of Israeli citizens working in construction is low, and Israelis joining the industry often aim to quickly move on to managerial positions. The industry is mostly manned by foreign nationals, including thousands of employees coming from the Palestinian Authority, Turkey, Romania, Moldova, Bulgaria, and China. Chen Zhong is the third construction worker to be killed on the job in a site operated by Solel Boneh Infrastructures Ltd., according to data collected by Kav LaOved, a Tel Aviv-based non-profit organization dedicated to maintaining labor rights in the Israeli industry. Solel Boneh is a subsidiary of Shikun & Binui Ltd., one of Israel’s largest real estate companies. Chen Zhong is also the fourth Chinese citizen to be killed on Israeli construction sites since August 2017, according to Kav LaOved. 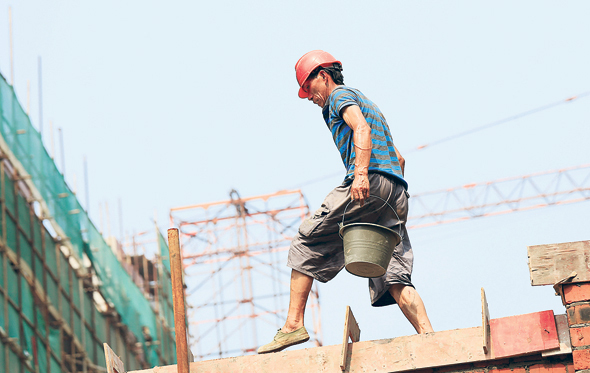 In 2015-2016, deaths on construction sites amounted to 62% of all work-related deaths in Israel, an 11% increase compared to 2013-2014, according to a report published in May by the Israeli State Comptroller, a government watchdog. According to the report, the state continually fails to investigate incidents and enforce laws and regulations regarding site safety. According to Kav LaOved’s data, 15 people have died and 67 were moderately or severely injured working on Israeli construction sites since the beginning of the year.